When BadAss Quilters Society announced the Urban Bright challenge, I was in the middle of some sort of fit of Challenge Entry Fever. I cannot figure out what gripped me given all the deadlines we have and knowing that my day job is bananas in the first quarter. But there I was, buying some fabric from Frond Design Studios for this graffiti quilt challenge. Then the fabric arrived and I looked at it and … I had nothing. I was so stumped. I got caught in the trap of thinking I need to stick to some rules I put into my head that weren’t actually part of the challenge it was actively unpleasant to think about. The fabric designs are graffiti themed, and I finally had a breakthrough when I started thinking of who was actually creating the graffiti. Rather than some of the traditional negative messages, these messages are full of hope and love and peace. Enter the ponies. Specifically, my childhood fondness for My Little Ponies. So I present, “My Little Tagger: Resistance is Magic”. I used one of the larger panel pieces as the side of a building, with some additional graffiti from the other panel. 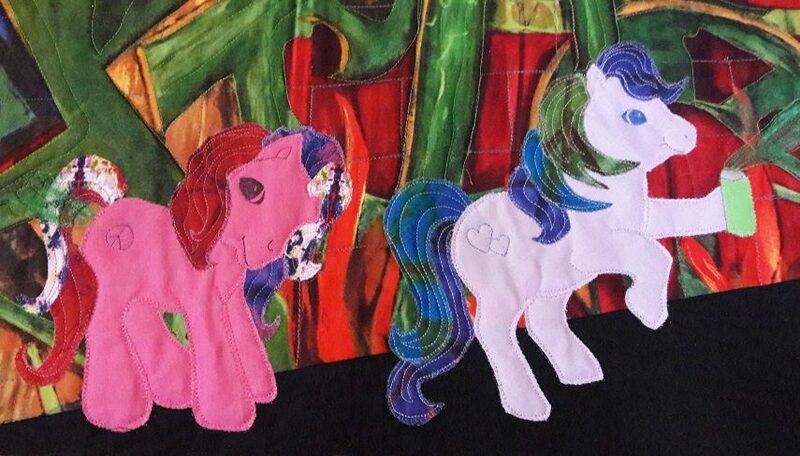 To make the ponies, I used some solids for the bodies and the other cuts of fabric to make the manes and tails. The cutie marks on their haunches and eyes are thread painted. To bring out the spray paint, I used some Shiva oil paint sticks. 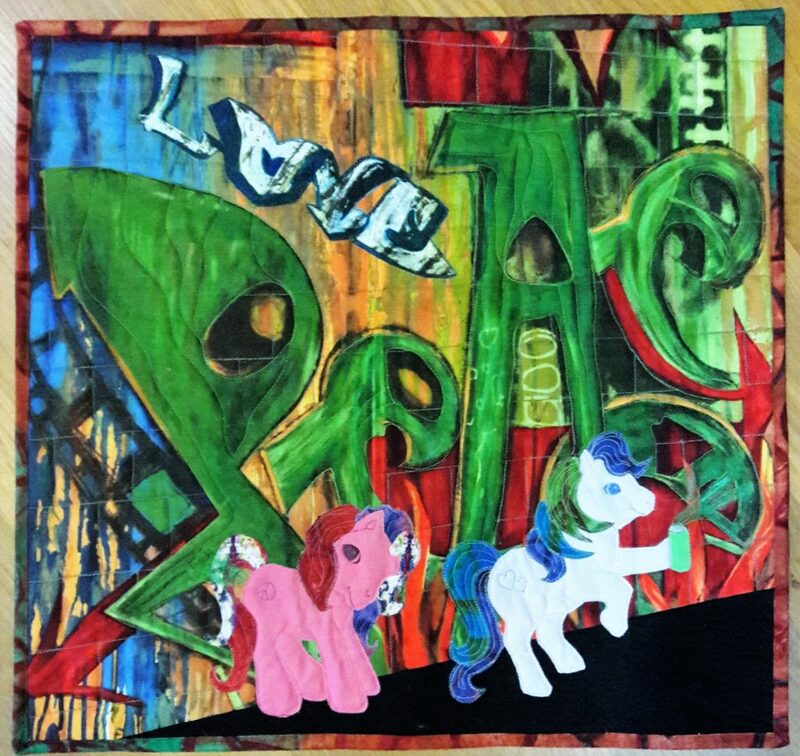 You’ll note one pony is using a can of spray paint, and the other is making use of some other ASSets for the artwork. I never claimed to have a normal sense of humor. Related: Lynn shared this bit of inspiration months before, so it must have gotten stuck in my brain. Geesh I remember I used to love my little pony. Great work Pam looks awesome. Love this!! I’m so impressed by the ponies! I LOVE what you did with this! Great idea!